Sermons at Union Congregational Church Preached by The Reverend Gail L. Miller January 27, 2019 Third Sunday after Epiphany I Corinthians 12:12-31a The Body of Christ The Church at its best. We’ve all seen it I hope…rejoicing together, suffering together… The operative word here….TOGETHER! Then there’s the church at its worst! Perhaps you’ve also seen that… This excellent image – the Body of Christ – was given because the church in Corinth was actually, at that time, the church at its worst. Here’s what was going on… The city of Corinth back then was a booming city – a seaport where merchants and travelers came together, known for its drunkenness and immorality. And amidst this, the first generation of the Christian church was trying to figure out its identity in that place. The church at Corinth was, as would be expected, a diverse church. There were the uneducated poor, probably some slaves and former slaves, as well as leaders from the community. The apostle Paul had lived in Corinth for a year and a half, and was well-liked by the congregation there. After he left, he kept in touch with them for several years, returning for visits at least twice. However, when he was away, conflicts arose in the church, and it was also of factions and divisions. Some felt that they were better than others, boasting about their beliefs and ways of doing things being more true. The church was close to splitting up, with each clique devoted to a different leader, claiming that only through their leader could they know the truth. And as each group emphasized the gifts demonstrated by its specific leader, they looked down on others and their specific gifts. There were even fights about how they were to celebrate the Lord’s Supper – imagine that! These cliques were so destructive to the church that they disrupted the worshiping life of the congregation, and when Paul heard about this he was so upset that he wrote to them – this church he loved – in an attempt to restore unity to the Corinthian church. His point is that our gifts are not intended to make us feel good or happy or more spiritual; they are not intended to strengthen our own personal views as we argue through issues in the church. Rather they are given for the sake of “the common good.” And then he says, “You are the body of Christ!” A great heresy of American popular religion is that “your religion is a personal thing.” It’s a heresy because that notion is about as far from Jesus and his teachings as you can get. Jesus did not come to heal and transform only individuals; he formed a community. He called together disciples, bringing together the most unlikely bunch of people and making them a community. When he was asked to teach them to pray, the prayer he taught them was corporate – OUR Father, not MY Father. Christianity is not a do-it-yourself religion. Sometimes faith begins as a personal relationship with God, but it will never be fully realized until you enter into Christian community. Being a Christian is keeping a balance between these two aspects of God’s call on our lives: To grow in a personal relationship with Christ And to grow in community with fellow Christians Our personal relationships with God/Christ are our private prayer life, our personal Bible reading and devotions, and our internal dialogue with God about discovering and discerning His will for us. When we neglect this aspect of our faith, we and our church are less than they could be. And the opposite is true as well. When our personal relationship with God remains just that – personal – as opposed to shared, again you and our church will be less than they could be. 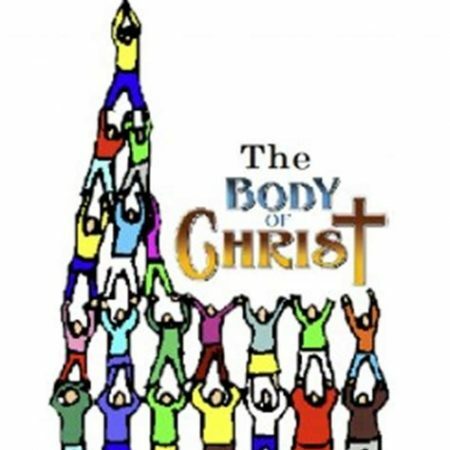 The church is – we are – the body of Christ. It is not a club for people who have the same interest, like the garden club or a sports team. Because the church is held together by something much more impressive than our personal interests – it is nurtured, sustained and thrives because the Holy Spirit is here, working in, among and through us. Think about the last few times you did something here at the church with other people – a committee meeting, an activity or event… Did you pray? Or talk about God’s presence or absence in your life? Or the difficult questions of faith and belief? Coming to church and not talking about God and our faith is like going to the garden club and not talking about plants and flowers. “You are the body of CHRIST,” Paul says. This means that the church is not what we make out of it. The church is what God makes out of us. The image Paul gives us – the body – is marvelous and obvious. I love it when he speaks so clearly! For body language is incarnational. Incarnation being the theological term for Christmas – carne – means meat or flesh – incarnation – God’s enfleshment – God becomes a human being in Jesus Christ. And now Paul tells us that we are the body of Christ – powerful stuff! It’s all about embodiment. And the dangers of becoming disembodied, Either because the church ignores its identity in Christ, Or because the life of faith does not engage with a body – the community. Our everyday lives are already becoming more and more disembodied. Look at how much of simple communication between people is no longer personal. Email and messaging for all their benefits are dangerously disembodied ways to interact with people. We all could tell stories of misunderstandings that occurred through email conversations. It’s hard enough to communicate clearly face-to-face sometimes – take away the face by using the phone and our capacity for clarity is diminished. Then take away the voice AND the face and…. Well… you know. The church, I believe, ought to offer an antidote of sorts to this dismembering trend in our culture. This is what the church is at its best – relationships between people, bound together in Christ. So what does this look like? What does this mean for our life together? Three things: (William Barclay) 1 – We need each other. There can be no such thing as isolation in the church. Sometimes we become so engrossed in the bit of the work that we are doing and so passionate about its importance that we can neglect or, at worst, criticize others who care more about other things. If the church is to be a healthy body, we need the work of everyone! 2 – We respect each other. If any limb or any organ ceases to function, the whole body is thrown out of whack. Same with the church – whenever we begin to think about how important our own work is, we are less than the church Christ wants us to be. 3 – We sympathize with each other. If any one part of the body is affected, all the others rejoice or suffer in sympathy because they cannot help it. The church is a whole, where we value each other, and care for each other, just like the hand comes to bandage the injured foot, or the foot hurries to take the injured head to the hospital. (N. T. Wright) So Paul draws us a picture of the unity that should exist inside the church, if it is to fulfill its proper function and truly be Christ’s body. And you know how it is with bodies. A body is healthy and efficient only when each part is healthy and functioning well. So much of the time, though, we are aware of the ways in which the body is broken. The Universal Church – all Christian churches – while we say we are united in Christ – are not in full fellowship and communion with one another. Roman Catholics and Protestants don’t take communion together. Many Baptist traditions don’t accept infant baptism and require a re-baptizing. This church as well has its own history, which includes times of brokenness in which you really experienced the truth of “when one member suffers all suffer together.” And when even one of us is going through a rough patch – we all feel it. I saw a meme this week, featuring Eeyore from Winnie the Pooh. It said this: One awesome thing about Eeyore is that even though he is basically clinically depressed, he still gets invited to participate in adventures and shenanigans with all his friends. They never expect him to pretend to feel happy, they never leave him behind or ask him to change. They just show him love. And the church that suffers together is also the church that rejoices together. When one of us is away for a while, and then makes it back to church…word spreads … Ellen is here today…. Cheryl is here today ! This is the church at its best – the body of Christ. Rejoicing together – suffering together. The point is to be together. Haven’t seen someone at church for a while? Give them a call. Make sure they’re okay. Because that’s what Christians do. That’s what the church is. The church is not a place where… The church is a people who… May we be those people. Amen.